Known objects in the Kuiper belt, derived from data from the Minor Planet Center. Objects in the main belt are coloured green, while scattered objects are coloured orange. The four outer planets are blue. Neptune’s few known trojansare yellow, while Jupiter’s are pink. The scattered objects between Jupiter’s orbit and the Kuiper belt are known ascentaurs. The scale is in astronomical units. The pronounced gap at the bottom is due to difficulties in detection against the background of the plane of the Milky Way. The Kuiper belt ( /ˈkaɪpər/, rhyming with “viper”), sometimes called the Edgeworth–Kuiper belt, is a region of the Solar System beyond the planets extending from the orbit of Neptune (at 30 AU) to approximately 50 AU from the Sun. It is similar to the asteroid belt, although it is far larger—20 times as wide and 20 to 200 times as massive. Like the asteroid belt, it consists mainly of small bodies, or remnants from the Solar System’s formation. While the asteroid belt is composed primarily of rock, ices, and metal, the Kuiper objects are composed largely of frozen volatiles (termed “ices”), such as methane, ammonia and water. The classical (low-eccentricity) belt is home to at least three dwarf planets: Pluto, Haumea, and Makemake. Some of the Solar System’s moons, such as Neptune‘s Triton and Saturn’s Phoebe, are also believed to have originated in the region. Pluto is the largest known member of the Kuiper belt, if the scattered disc is excluded. Originally considered a planet, Pluto’s position as part of the Kuiper belt has caused it to be reclassified as a “dwarf planet“. It is compositionally similar to many other objects of the Kuiper belt, and its orbital period is identical to that of the KBOs known as “plutinos“. In Pluto’s honour, the four currently accepted dwarf planets beyond Neptune’s orbit are called “plutoids“. The Kuiper belt should not be confused with the hypothesized Oort cloud, which is a thousand times more distant. The objects within the Kuiper belt, together with the members of the scattered disc and any potential Hills cloud or Oort cloud objects, are collectively referred to as trans-Neptunian objects(TNOs). Since the discovery of Pluto, many have speculated that it might not be alone. The region now called the Kuiper belt had been hypothesized in various forms for decades. It was only in 1992 that the first direct evidence for its existence was found. The number and variety of prior speculations on the nature of the Kuiper belt have led to continued uncertainty as to who deserves credit for first proposing it. The first astronomer to suggest the existence of a trans-Neptunian population was Frederick C. Leonard. In 1930, soon after Pluto’s discovery by Clyde Tombaugh, Leonard pondered whether it was “not likely that in Pluto there has come to light the first of a series of ultra-Neptunian bodies, the remaining members of which still await discovery but which are destined eventually to be detected”. In 1943, in the Journal of the British Astronomical Association, Kenneth Edgeworth hypothesized that, in the region beyond Neptune, the material within the primordial solar nebulawas too widely spaced to condense into planets, and so rather condensed into a myriad of smaller bodies. From this he concluded that “the outer region of the solar system, beyond the orbits of the planets, is occupied by a very large number of comparatively small bodies” and that, from time to time, one of their number “wanders from its own sphere and appears as an occasional visitor to the inner solar system”, becoming a comet. In 1951, in an article for the journal Astrophysics, Gerard Kuiper speculated on a similar disc having formed early in the Solar System’s evolution; however, he did not believe that such a belt still existed today. Kuiper was operating on the assumption common in his time, that Pluto was the size of the Earth, and had therefore scattered these bodies out toward the Oort cloud or out of the Solar System. Were Kuiper’s hypothesis correct, there would not be a Kuiper belt where we now see it. The hypothesis took many other forms in the following decades: in 1962, physicist Al G.W. Cameron postulated the existence of “a tremendous mass of small material on the outskirts of the solar system”, while in 1964, Fred Whipple, who popularised the famous “dirty snowball” hypothesis for cometary structure, thought that a “comet belt” might be massive enough to cause the purported discrepancies in the orbit of Uranus that had sparked the search for Planet X, or at the very least, to affect the orbits of known comets.Observation, however, ruled out this hypothesis. In 1977, Charles Kowal discovered 2060 Chiron, an icy planetoid with an orbit between Saturn and Uranus. He used a blink comparator; the same device that had allowed Clyde Tombaugh to discover Pluto nearly 50 years before. In 1992, another object, 5145 Pholus, was discovered in a similar orbit. Today, an entire population of comet-like bodies, the centaurs, is known to exist in the region between Jupiter and Neptune. The centaurs’ orbits are unstable and have dynamical lifetimes of a few million years. From the time of Chiron’s discovery, astronomers speculated that they therefore must be frequently replenished by some outer reservoir. Further evidence for the belt’s existence later emerged from the study of comets. That comets have finite lifespans has been known for some time. As they approach the Sun, its heat causes their volatilesurfaces to sublimate into space, eating them gradually away. In order to still be visible over the age of the Solar System, they must be frequently replenished. One such area of replenishment is the Oort cloud, the spherical swarm of comets extending beyond 50 000 AU from the Sun first hypothesised by astronomer Jan Oort in 1950. It is believed to be the point of origin for long period comets, those, likeHale-Bopp, with orbits lasting thousands of years. There is however another comet population, known as short period or periodic comets; those, like Halley, with orbits lasting less than 200 years. By the 1970s, the rate at which short-period comets were being discovered was becoming increasingly inconsistent with them having emerged solely from the Oort cloud. For an Oort cloud object to become a short-period comet, it would first have to be captured by the giant planets. In 1980, in the Monthly Notices of the Royal Astronomical Society, Julio Fernandez stated that for every short period comet to be sent into the inner solar system from the Oort cloud, 600 would have to be ejected into interstellar space. He speculated that a comet belt from between 35 and 50 AU would be required to account for the observed number of comets. Following up on Fernandez’s work, in 1988 the Canadian team of Martin Duncan, Tom Quinn and Scott Tremaine ran a number of computer simulations to determine if all observed comets could have arrived from the Oort cloud. They found that the Oort cloud could not account for all short-period comets, particularly as short-period comets are clustered near the plane of the Solar System, whereas Oort cloud comets tend to arrive from any point in the sky. With a belt as Fernandez described it added to the formulations, the simulations matched observations. Reportedly because the words “Kuiper” and “comet belt” appeared in the opening sentence of Fernandez’s paper, Tremaine named this hypothetical region the “Kuiper belt”. In 1987, astronomer David Jewitt, then at MIT, became increasingly puzzled by “the apparent emptiness of the outer Solar System”. He encouraged then-graduate student Jane Luu to aid him in his endeavour to locate another object beyond Pluto‘s orbit, because, as he told her, “If we don’t, nobody will.”. Using telescopes at the Kitt Peak National Observatory in Arizona and the Cerro Tololo Inter-American Observatory in Chile, Jewitt and Luu conducted their search in much the same way as Clyde Tombaugh and Charles Kowal had, with a blink comparator. Initially, examination of each pair of plates took about eight hours, but the process was sped up with the arrival of electronic charge-coupled devices or CCDs, which, though their field of view was narrower, were not only more efficient at collecting light (they retained 90 percent of the light that hit them, rather than the ten percent achieved by photographs) but allowed the blinking process to be done virtually, on a computer screen. Today, CCDs form the basis for most astronomical detectors. In 1988, Jewitt moved to the Institute of Astronomy at the University of Hawaii. Luu later joined him to work at the University of Hawaii’s 2.24 m telescope at Mauna Kea. Eventually, the field of view for CCDs had increased to 1024 by 1024 pixels, which allowed searches to be conducted far more rapidly. Finally, after five years of searching, on August 30, 1992, Jewitt and Luu announced the “Discovery of the candidate Kuiper belt object” (15760) 1992 QB1. Six months later, they discovered a second object in the region, (181708) 1993 FW. Studies since the trans-Neptunian region was first charted have shown that in fact, the region now called the Kuiper belt is not the point of origin for short-period comets, but that they instead derive from a linked population called the scattered disc. The scattered disc was created when Neptune migrated outward into the proto-Kuiper belt, which at the time was much closer to the Sun, and left in its wake a population of dynamically stable objects which could never be affected by its orbit (the Kuiper belt proper), and a population whose perihelia are close enough that Neptune can still disturb them as it travels around the Sun (the scattered disc). Because the scattered disc is dynamically active and the Kuiper belt relatively dynamically stable, the scattered disc is now seen as the most likely point of origin for periodic comets. Astronomers will sometimes use alternative name Edgeworth–Kuiper belt to credit Edgeworth, and KBOs are occasionally referred to as EKOs. However, Brian Marsden claims neither deserve true credit; “Neither Edgeworth or Kuiper wrote about anything remotely like what we are now seeing, but Fred Whipple did.” Conversely, David Jewitt comments that, “If anything … Fernandez most nearly deserves the credit for predicting the Kuiper Belt.” The term trans-Neptunian object (TNO) is recommended for objects in the belt by several scientific groups because the term is less controversial than all others—it is not a synonym though, as TNOs include all objects orbiting the Sun past the orbit of Neptune, not just those in the Kuiper belt. The precise origins of the Kuiper belt and its complex structure are still unclear, and astronomers are awaiting the completion of several wide-field survey telescopes such as Pan-STARRS and the future LSST, which should reveal many currently unknown KBOs. These surveys will provide data that will help determine answers to these questions. The Kuiper belt is believed to consist of planetesimals; fragments from the original protoplanetary disc around the Sun that failed to fully coalesce into planets and instead formed into smaller bodies, the largest less than 3,000 kilometres (1,900 mi) in diameter. Modern computer simulations show the Kuiper belt to have been strongly influenced by Jupiter and Neptune, and also suggest that neither Uranus nor Neptune could have formed in situ beyond Saturn, as too little primordial matter existed at that range to produce objects of such high mass. Instead, these planets are believed to have formed closer to Jupiter, and migrated outwards during the course of the Solar System’s early evolution. Eventually, the orbits shifted to the point where Jupiter and Saturn existed in an exact 2:1 resonance; Jupiter orbited the Sun twice for every one Saturn orbit. The gravitational pull from such a resonance ultimately disrupted the orbits of Uranus and Neptune, causing Neptune’s orbit to move outward into the primordial planetesimal disk, which sent the disk into temporary chaos. As Neptune traveled along this modified orbit, it excited and scattered many TNO planetesimals into higher and more eccentric orbits, depleting the primordial population. However, the present most popular model still fails to account for many of the characteristics of the distribution and, quoting one of the scientific articles, the problems “continue to challenge analytical techniques and the fastest numerical modeling hardware and software”. The frequency of paired objects, many of which are far apart and loosely bound, also poses a problem for the Nice model of formation. Dust in the Kuiper belt creates a faintinfrared disk. At its fullest extent, including its outlying regions, the Kuiper belt stretches from roughly 30 to 55 AU. However, the main body of the belt is generally accepted to extend from the 2:3 resonance (see below) at 39.5 AU to the 1:2 resonance at roughly 48 AU. The Kuiper belt is quite thick, with the main concentration extending as much as ten degrees outside the ecliptic plane and a more diffuse distribution of objects extending several times farther. Overall it more resembles a torus or doughnut than a belt. Its mean position is inclined to the ecliptic by 1.86 degrees. The presence of Neptune has a profound effect on the Kuiper belt’s structure due to orbital resonances. Over a timescale comparable to the age of the Solar System, Neptune’s gravity destabilises the orbits of any objects which happen to lie in certain regions, and either sends them into the inner Solar System or out into thescattered disc or interstellar space. This causes the Kuiper belt to possess pronounced gaps in its current layout, similar to the Kirkwood gaps in the asteroid belt. In the region between 40 and 42 AU, for instance, no objects can retain a stable orbit over such times, and any observed in that region must have migrated there relatively recently. Between the 2:3 and 1:2 resonances with Neptune, at approximately 42–48 AU, the gravitational influence of Neptune is negligible, and objects can exist with their orbits essentially unmolested. This region is known as the classical Kuiper belt, and its members comprise roughly two thirds of KBOs observed to date. 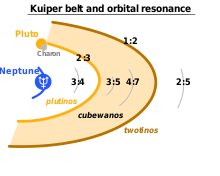 Because the first modern KBO discovered, 1992 QB1, is considered the prototype of this group, classical KBOs are often referred to as cubewanos (“Q-B-1-os”). The guidelines established by the IAU demand that classical KBOs be given names of mythological beings associated with creation. The classical Kuiper belt appears to be a composite of two separate populations. The first, known as the “dynamically cold” population, has orbits much like the planets; nearly circular, with an orbital eccentricity of less than 0.1, and with relatively low inclinations up to about 10° (they lie close to the plane of the Solar System rather than at an angle). The second, the “dynamically hot” population, has orbits much more inclined to the ecliptic, by up to 30°. The two populations have been named this way not because of any major difference in temperature, but from analogy to particles in a gas, which increase their relative velocity as they become heated up. The two populations not only possess different orbits, but different compositions; the cold population is markedly redder than the hot, suggesting it formed in a different region. The hot population is believed to have formed near Jupiter, and to have been ejected out by movements among the gas giants. The cold population, on the other hand, is believed to have formed more or less in its current position although it may also have been later swept outwards by Neptune during its migration. Distribution of cubewanos (blue),Resonant trans-Neptunian objects (red) and near scattered objects (grey). When an object’s orbital period is an exact ratio of Neptune’s (a situation called a mean motion resonance), then it can become locked in a synchronised motion with Neptune and avoid being perturbed away if their relative alignments are appropriate. If, for instance, an object is in just the right kind of orbit so that it orbits the Sun two times for every three Neptune orbits, and if it reaches perihelion with Neptune a quarter of an orbit away from it, then whenever it returns to perihelion, Neptune will always be in about the same relative position as it began, since it will have completed 1½ orbits in the same time. This is known as the 2:3 (or 3:2) resonance, and it corresponds to a characteristic semi-major axis of about 39.4 AU. This 2:3 resonance is populated by about 200 known objects, including Pluto together with its moons. In recognition of this, the other members of this family are known as plutinos. Many plutinos, including Pluto, often have orbits which cross that of Neptune, though their resonance means they can never collide. Many others, such as 90482 Orcus and 28978 Ixion, are large enough to probably qualify as plutoids when more is known about them. Plutinos have high orbital eccentricities, suggesting that they are not native to their current positions but were instead thrown haphazardly into their orbits by the migrating Neptune. IAU guidelines dictate that all plutinos must, like Pluto, be named for underworld deities. The 1:2 resonance (whose objects complete half an orbit for each of Neptune’s) corresponds to semi-major axes of ~47.7AU, and is sparsely populated. Its residents are sometimes referred to as twotinos. Other resonances also exist at 3:4, 3:5, 4:7 and 2:5. Neptune possesses a number of trojan objects, which occupy its L4 and L5 points; gravitationally stable regions leading and trailing it in its orbit. Neptune trojans are often described as being in a 1:1 resonance with Neptune. Neptune trojans are remarkably stable in their orbits and are unlikely to have been captured by Neptune, but rather to have formed alongside it. Additionally, there is a relative absence of objects with semi-major axes below 39 AU which cannot apparently be explained by the present resonances. The currently accepted hypothesis for the cause of this is that as Neptune migrated outward, unstable orbital resonances moved gradually through this region, and thus any objects within it were swept up, or gravitationally ejected from it. Graph showing the numbers of KBOs for a given distance from the Sun. The plutinos are the “spike” at 40 AU, while the classicals are between 42 and 47 AU, and the twotinos are at 48 AU. The 1:2 resonance appears to be an edge beyond which few objects are known. It is not clear whether it is actually the outer edge of the classical belt or just the beginning of a broad gap. Objects have been detected at the 2:5 resonance at roughly 55 AU, well outside the classical belt; however, predictions of a large number of bodies in classical orbits between these resonances have not been verified through observation. Earlier models of the Kuiper belt had suggested that the number of large objects would increase by a factor of two beyond 50 AU, so this sudden drastic falloff, known as the “Kuiper cliff”, was completely unexpected, and its cause, to date, is unknown. Bernstein and Trilling et al. have found evidence that the rapid decline in objects of 100 km or more in radius beyond 50 AU is real, and not due to observational bias. Possible explanations include that material at that distance is too scarce or too scattered to accrete into large objects, or that subsequent processes removed or destroyed those which did form. Patryk Lykawka of Kobe University has claimed that the gravitational attraction of an unseen large planetary object, perhaps the size of Earth or Mars, might be responsible. Studies of the Kuiper belt since its discovery have generally indicated that its members are primarily composed of ices: a mixture of light hydrocarbons (such asmethane), ammonia, and water ice, a composition they share with comets. The low densities observed in those KBOs whose diameter is known, (less than 1 g cm−3) is consistent with an icy makeup. The temperature of the belt is only about 50K, so many compounds that would be gaseous closer to the Sun remain solid. Due to their small size and extreme distance from Earth, the chemical makeup of KBOs is very difficult to determine. The principal method by which astronomers determine the composition of a celestial object is spectroscopy. When an object’s light is broken into its component colours, an image akin to a rainbow is formed. This image is called a spectrum. Different substances absorb light at different wavelengths, and when the spectrum for a specific object is unravelled, dark lines (calledabsorption lines) appear where the substances within it have absorbed that particular wavelength of light. Every element or compound has its own unique spectroscopic signature, and by reading an object’s full spectral “fingerprint”, astronomers can determine what it is made of. Initially, such detailed analysis of KBOs was impossible, and so astronomers were only able to determine the most basic facts about their makeup, primarily their colour. These first data showed a broad range of colours among KBOs, ranging from neutral grey to deep red. This suggested that their surfaces were composed of a wide range of compounds, from dirty ices to hydrocarbons. This diversity was startling, as astronomers had expected KBOs to be uniformly dark, having lost most of their volatile ices to the effects of cosmic rays. Various solutions were suggested for this discrepancy, including resurfacing by impacts or outgassing. However, Jewitt and Luu’s spectral analysis of the known Kuiper belt objects in 2001 found that the variation in colour was too extreme to be easily explained by random impacts. Although to date most KBOs still appear spectrally featureless due to their faintness, there have been a number of successes in determining their composition. In 1996, Robert H. Brown et al. obtained spectroscopic data on the KBO 1993 SC, revealing its surface composition to be markedly similar to that of Pluto, as well as Neptune’s moon Triton, possessing large amounts of methane ice. Water ice has been detected in several KBOs, including 1996 TO66, 2000 EB173 and 2000 WR106. In 2004, Mike Brown et al. determined the existence of crystalline water ice and ammonia hydrate on one of the largest known KBOs, 50000 Quaoar. Both of these substances would have been destroyed over the age of the solar system, suggesting that Quaoar had been recently resurfaced, either by internal tectonic activity or by meteorite impacts. Despite its vast extent, the collective mass of the Kuiper belt is relatively low. The total mass is estimated at range between a 25th and 10th the mass of the Earth with some estimates placing it at a thirtieth an Earth mass. Conversely, models of the Solar System’s formation predict a collective mass for the Kuiper belt of 30 Earth masses. This missing >99% of the mass can hardly be dismissed, as it is required for the accretion of any KBOs larger than 100 km (62 mi) in diameter. If the Kuiper belt had always had its current low density these large objects simply could not have formed. Moreover, the eccentricity and inclination of current orbits makes the encounters quite “violent,” resulting in destruction rather than accretion. It appears that either the current residents of the Kuiper belt have been created closer to the Sun or some mechanism dispersed the original mass. Neptune’s current influence is too weak to explain such a massive “vacuuming”, though the Nice model proposes that it could have been the cause of mass removal in the past. 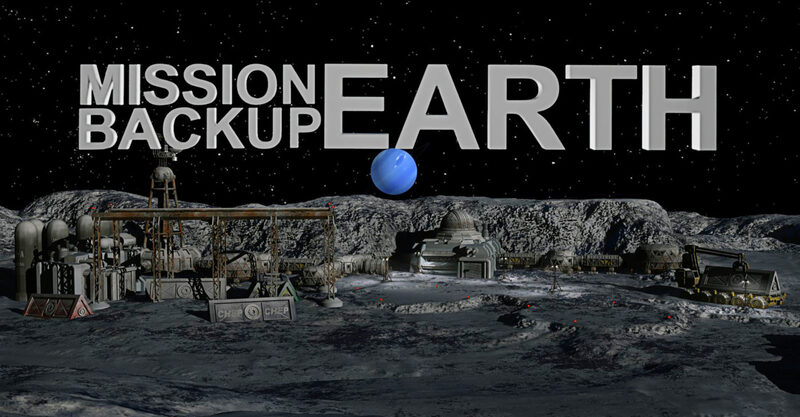 While the question remains open, the conjectures vary from a passing star scenario to grinding of smaller objects, via collisions, into dust small enough to be affected by solar radiation. Less formally, there are for instance 8 (=23) times more objects in 100–200 km range than objects in 200–400 km range. In other words, for every object with the diameter of 1,000 km (621 mi) there should be around 1000 (=103) objects with diameter of 100 km (62 mi). The law is expressed in this differential form rather than as a cumulative cubic relationship, because only the middle part of the slope can be measured; the law must break at smaller sizes, beyond the current measure. Of course, only the magnitude is actually known, the size is inferred assuming albedo (not a safe assumption for larger objects). Since January 2010, the smallest Kuiper belt object discovered to date spans 980 m across. The orbits of objects in the scattered disc; the classical KBOs are blue, while the 2:5 resonant objects are green. The scattered disc is a sparsely populated region, overlapping with the Kuiper belt but extending as far as 100 AU and farther. Scattered disc objects (SDOs) travel in highly elliptical orbits, usually also highly inclined to the ecliptic. Most models of solar system formation show both KBOs and SDOs first forming in a primordial comet belt, while later gravitational interactions, particularly with Neptune, sent the objects spiraling outward; some into stable orbits (the KBOs) and some into unstable orbits, becoming the scattered disc. Due to its unstable nature, the scattered disc is believed to be the point of origin for many of the Solar System’s short-period comets. Their dynamic orbits occasionally force them into the inner Solar System, becoming first centaurs, and then short-period comets. According to the Minor Planet Center, which officially catalogues all trans-Neptunian objects, a KBO, strictly speaking, is any object that orbits exclusively within the defined Kuiper belt region regardless of origin or composition. Objects found outside the belt are classed as scattered objects. However, in some scientific circles the term “Kuiper belt object” has become synonymous with any icy planetoid native to the outer solar system believed to have been part of that initial class, even if its orbit during the bulk of solar system history has been beyond the Kuiper belt (e.g. in the scattered disc region). They often describe scattered disc objects as “scattered Kuiper belt objects.” Eris, the recently discovered object now known to be larger than Pluto, is often referred to as a KBO, but is technically an SDO. A consensus among astronomers as to the precise definition of the Kuiper belt has yet to be reached, and this issue remains unresolved. The centaurs, which are not normally considered part of the Kuiper belt, are also believed to be scattered objects, the only difference being that they were scattered inward, rather than outward. The Minor Planet Center groups the centaurs and the SDOs together as scattered objects. During its period of migration, Neptune is thought to have captured one of the larger KBOs and set it in orbit around itself. This is its moon Triton, which is the only large moon in the Solar System to have a retrograde orbit; it orbits in the opposite direction to Neptune’s rotation. This suggests that, unlike the large moons of Jupiter and Saturn, which are thought to have coalesced from spinning discs of material encircling their young parent planets, Triton was a fully formed body that was captured from surrounding space. Gravitational capture of an object is not easy; it requires that some force act upon the object to slow it down enough to be snared by the larger object’s gravity. How this happened to Triton is not well understood, though it does suggest that Triton formed as part of a large population of similar objects whose gravity could impede its motion enough to be captured. Triton is only slightly larger than Pluto, and spectral analysis of both worlds shows that they are largely composed of similar materials, such as methane and carbon monoxide. All this points to the conclusion that Triton was once a KBO that was captured by Neptune during its outward migration. Since the year 2000, a number of KBOs with diameters of between 500 and 1,500 km (932 mi), more than half that of Pluto, have been discovered. 50000 Quaoar, a classical KBO discovered in 2002, is over 1,200 km across. Makemake (originally (136472) 2005 FY9, nicknamed “Easterbunny”) and Haumea (originally(136108) 2003 EL61, nicknamed “Santa”), both announced on July 29, 2005, are larger still. Other objects, such as 28978 Ixion (discovered in 2001) and 20000 Varuna (discovered in 2000) measure roughly 500 km (311 mi) across. The discovery of these large KBOs in similar orbits to Pluto led many to conclude that, bar its relative size, Pluto was not particularly different from other members of the Kuiper belt. Not only did these objects approach Pluto in size, but many also possessed satellites, and were of similar composition (methane and carbon monoxide have been found both on Pluto and on the largest KBOs). Thus, just as Ceres was considered a planet before the discovery of its fellowasteroids, some began to suggest that Pluto might also be reclassified. The issue was brought to a head by the discovery of Eris, an object in the scattered disc far beyond the Kuiper belt, that is now known to be 27 percent more massive than Pluto. In response, the International Astronomical Union (IAU), was forced to define what a planet is for the first time, and in so doing included in their definition that a planet must have “cleared the neighbourhood around its orbit.” As Pluto shared its orbit with so many KBOs, it was deemed not to have cleared its orbit, and was thus reclassified from a planet to a member of the Kuiper belt. Though Pluto is the largest KBO, a number of objects outside the Kuiper belt which may have begun their lives as KBOs are larger. Eris is the most obvious example, but Neptune’s moon Triton, which, as explained above, is probably a captured KBO, is also larger than Pluto. As of 2008, only five objects in the Solar System, Ceres, Pluto, Eris, Makemake and Haumea, are considered dwarf planets. However, a number of other Kuiper belt objects are also large enough to be spherical and could be classified as dwarf planets in the future. Of the four largest TNOs, three (Eris, Pluto, and Haumea) possess satellites, and two have more than one. A higher percentage of the larger KBOs possess satellites than the smaller objects in the Kuiper belt, suggesting that a different formation mechanism was responsible. There are also a high number of binaries (two objects close enough in mass to be orbiting “each other”) in the Kuiper belt. The most notable example is the Pluto-Charon binary, but it is estimated that around 11 percent of KBOs exist in binaries. On January 19, 2006 the first spacecraft mission to explore the Kuiper belt, New Horizons, was launched. The mission, headed by Alan Stern of the Southwest Research Institute, will arrive at Pluto on July 14, 2015, and, circumstances permitting, will continue on to study another as-yet undetermined KBO. Any KBO chosen will be between 25 and 55 miles (40 to 90 km) in diameter and, ideally, white or grey, to contrast with Pluto’s reddish colour. John Spencer, an astronomer on the New Horizons mission team, says that no target for a post-Pluto Kuiper belt encounter has yet been selected, as they are awaiting data from the Pan-STARRS survey project to ensure as wide a field of options as possible. The Pan-STARRS project, partially operational since May 2010, will, when fully online, survey the entire sky with four 1.4 gigapixel digital cameras to detect any moving objects, from near-earth objects to KBOs. To speed up the detection process, the New Horizons team established Ice Hunters, a citizen science project that allows members of the public to participate in the search for suitable KBO targets. The debris disks around two stars (HD 139664and HD 53143). The black central circle is produced by the camera’s coronagraph, which hides the central star to allow the much fainter disks to be seen. By 2006, astronomers had resolved dust disks believed to be Kuiper belt-like structures around nine stars other than the Sun. They appear to fall into two categories: wide belts, with radii of over 50 AU, and narrow belts (like our own Kuiper belt) with radii of between 20 and 30 AU and relatively sharp boundaries.Beyond this, 15–20% of solar-type stars have an observed infrared excess which is believed to indicate massive Kuiper belt-like structures. Most knowndebris discs around other stars are fairly young, but the two images on the right, taken by the Hubble Space Telescope in January 2006, are old enough (roughly 300 million years) to have settled into stable configurations. The left image is a “top view” of a wide belt, and the right image is an “edge view” of a narrow belt. Supercomputer simulations of dust in the Kuiper belt suggest that when it was younger, it may have resembled the narrow rings seen around younger stars.